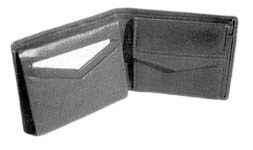 A convenient wallet for the men's hip pocket. It is closed by the tab & dome button system. On opening it has a main zip pocket for currency notes and an extra compartment. There are two side pockets and three credit card slots on each side. This leather purse has a size of 9.5 x 12.5 cm. It is closed by a leather loop with a press button. On the back is a flap that opens a pocket for coins. On opening the loop you have two note compartments, four plastic windows and six credit card slots. A Gents leather billfold. It has a beautiful design on the front that can be made in a contrasting colour upon request. On opening, the RHS has a coin pocket that is closed by a press button. On the LHS there is a flap with three credit card slots. 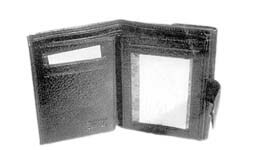 Beneath the flap is a mesh or transparent window for the driving license and 3 credit card slots. A convenient billfold for the hip pocket. It is closed by the tab & dome button system. On opening it has a main zip pocket for currency notes and an extra compartment. There are two side pockets and three credit card slots on one side. There is a press button pocket for coins. There is a secret pocket in the second note compartment. An oil pull up note case wallet. On the exterior back is a pocket of size 10 x 13 cm. 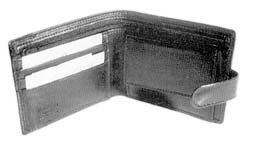 The wallet has two currency note compartments and two side pockets. 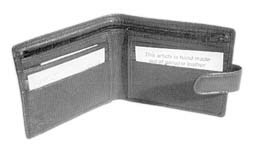 On the RHS is a coin zip pocket with a card pocket that has net window displayed at the bottom. 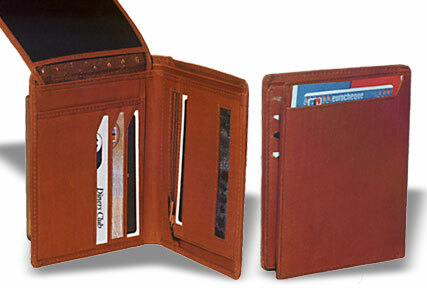 The flap on the LHS has 4 credit card slots and behind the flap is a net window for the driving license. Beneath the flap are three more credit cards slots and a pocket of size 9.5 x 12cm.